The Garden House is surrounded by the beauty and serenity of lush, tropical, botanical gardens. Garden House has an upper and a lower residence, with tropical garden views from every window. Both are fully furnished with phones, cable TV, DVD, high speed Internet, wi-fi. A covered lanai next to the lower residence has a third bathroom. Upper Residence sleeps 6. Two bedrooms and third bedroom on enclosed sun porch. Full bathroom with shower and tub. Roomy island kitchen. Spacious, open, living room with many windows and views. Dining area on an enclosed sun porch to enjoy the surrounding beauty. Lower Residence sleeps 4. Two bedrooms, bathroom with shower and living room. Sliding glass doors open to the botanical gardens and fruit orchards. Garden House (5 bedrooms) $450/night. Upper Residence only (3 bedrooms) $270/night. Lower Residence only (2 bedrooms) $180/night. Road to Hana and Hana Town: There is Maui, and then there is Heavenly Hana. Isolated from the rest of the island, the Hana Coast is the last undeveloped tropical paradise on Maui. Hana has been saved from progress by the serpentine Road to Hana. The view of the coastline is spectacular with waterfalls splashing beside the road, and plunge pools lipped in ferns. The charm of Hana Town is that little has changed in the past 25 years, perpetuating the small town atmosphere, Hawaiian culture, and scenic beauty. Hana Palms Retreat at Hana Gardenland is conveniently located on the Hana Road, just three and one-half miles before Hana Town, seven minutes by car, and one mile from Waianapanapa State Park. Location on the Hana Coast: Hana Gardenland is 3.5 miles from Hana Town, where there are 2 general stores and 2 restaurants. Hana Gardenland is about 1 mile from Waianapanapa black sands beach, 4 miles from Red Sands beach in Hana and 5 miles from Hamoa white sands beach. Hana Gardenland: Hana Gardenland encompasses 5 acres of awesome tropical botanical gardens. Thousands of rare and unusual plants and flowers from around the world flourish here. Gardenland has one of the most diverse palm tree collections on Maui with 100 varieties. Botanical signs name the tree and country of origin. Immerse your senses in a tropical paradise. Walk on grassy paths wandering through lush gardens. See towering palms, rainbow eucalyptus, hanging banyans, exotic fruit trees. Feel a moist breeze on your skin. Listen to bird song. Smell ginger, jasmine, tropical flowers. Taste ripe avocados, lilikoi, bananas, papayas, coconuts, figs. The Hawaiian Islands have some of the most remote and benign tropical rainforests in the world. Nevertheless, like any moist and fertile environment, Hana Gardenland is also home to insects like mosquitos, ants and roaches and critters like little geckos that share this beautiful world with humans. During rainy periods, there can be tropical mildew smell in the houses, and people hypersensitive to mold may not find this an appropriate environment. As along much of the Hana Coast, there is no cell phone service in this area, so each residence has house phones. 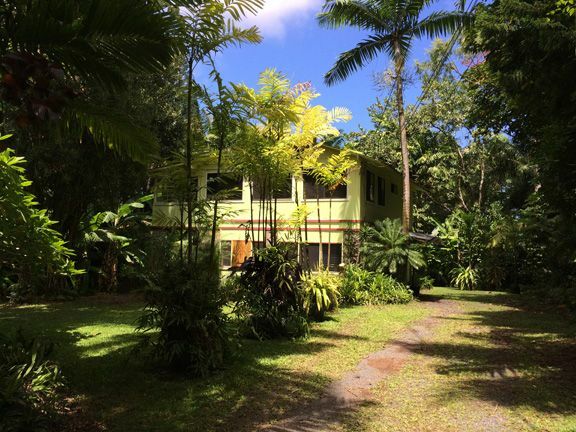 We know you will appreciate the privacy and serenity of Hana Palms Retreat. We ask our guests to respect the privacy of our neighbors, since loud voices and music can carry a long way, disturbing the ambiance of the neighborhood. After 11 PM our neighbors appreciate the quiet and peacefulness of the Hana night, accompanied by the natural sounds coming from the lush rainforest and the welcoming rain. County of Maui Short Term Rental Home Permit #STHA 2014/0001. Over the past eight years I have been the steward of these remarkable botanical gardens in Hana Maui. For over 30 years I have been a serial green business entrepreneur, developing innovative companies growing algae for green food supplements in 30 countries and building beautiful bamboo homes in the Hawaiian Islands. I also own with my brothers a 150 acre farm and forest near Olympia Washington. I am a documentary filmmaker, and have produced a series of dvds. I fell in love with this beautifully planted botanical garden in Hana. Over 40 years ago the original owner planted 100 kinds of palm trees from seeds collected from all over the world, calling it a love garden. Over the years, many exotic ornamental trees and tropical fruit trees were planted all over the property. Now lawns and pathways weave through these magical gardens. Staying here is great for a couple or small family. It has generous space for multiple families for gatherings and reunions. Retreat groups come and stay for a week. Hana Gardenland is a perfect model for eco-tourism, where guests and visitors can roam the botanical gardens and learn about plants thriving in the Hana Maui ecosystem, enjoying tropical fruit in season along the way. Our laundry room with washer and dryer is located in another building on the property. We schedule laundry for both houses. Helpful to let us know in advance if you wish laundry, so we can schedule to wash and dry your laundry for you.